There has been growing concern that both intensive agriculture in the developed world and rapid expansion of crop cultivation in developing countries is damaging the health of soils which are the foundation of farming. At the same time we are discovering much more about how complex soils are as living biological systems. This volume reviews the latest research on soil science. After an overview of the role of soil as a provider of ecosystem services and in conservation agriculture, the book reviews soil structure and chemistry as well organic matter, soil microorganisms and fauna. The second part of the book discusses soil dynamics, from water and nutrient cycles to carbon capture and erosion mechanisms. With its distinguished editor and international team of expert authors, this will be a standard reference for soil scientists and agronomists as well as the farming community and government agencies responsible for monitoring soil health. It is accompanied by a companion volume looking at soil monitoring and management. Not sure what you're getting if you buy this book? 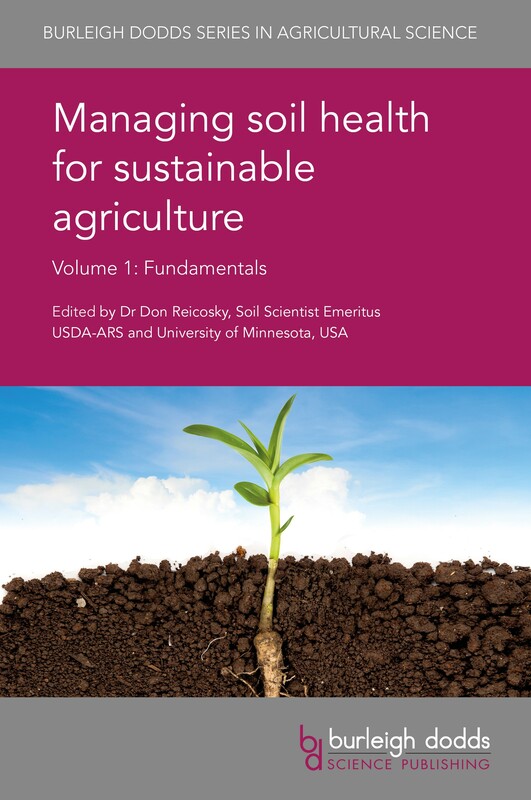 Click on the cover image below to open a PDF and preview pages from the book. .
"Managing soil health for sustainable agriculture covers virtually the entire range of soil health topics. Dr Don Reicosky, himself an internationally distinguished soil scientist, has assembled an impressive roster of chapter authors. Each is a world-class specialist in the topic of the chapter. This collection of diverse chapters by highly respected authors promises to be a most interesting read and useful reference."